So who attended and how did it go? I’m very curious to know how many people showed up to oppose the development? On Monday, January 7, the Village's Plan Commission held a public hearing to review the proposal for the Planned Unit Development of the former Giesche Shoe site and the Village owned parking lot at 418 - 424 N. Main Street. Over 200 residents and business owners attended the meeting. After presentations by Village staff and the developer, the commission heard public comment from over 30 attendees. Public comments addressed both concerns and support for the proposed project. The Plan Commission then deliberated and ultimately recommended approval, with a unanimous vote, of the project to the Village Board. The Village Board is scheduled to discuss specific components of the project, including financial assistance and the proposed conditions recommended by the Plan Commission during an upcoming Village Board workshop on Tuesday, January 22 at 7 p.m. The Village Board is expected to give final consideration of all aspects of the proposed development at the Monday, January 28 regularly scheduled Village Board meeting at 7 p.m.
Over 200 residents and business owners attended the meeting. After presentations by Village staff and the developer, the commission heard public comment... (and then) recommended approval, with a unanimous vote, of the project to the Village Board. Do residents really still try to influence these things? There are several threads on Facebook on this development, 95% of the opinions on Facebook seem to be against it. I would guesstimate that would amount to about 200+ people from what I've seen. People want to maintain the small town charm that is GE. Personally, I think this needs to move forward, the abandon Gieshe's is an eyesore. Is it just me or does anything new in GE automatically meet with a group to protest it. DuPage Medical, Montessori school, Gas Station at 5 corners, etc. I'm sure yard signs will be popping up soon. I'm sure yard signs will be popping up soon. For all your yard sign needs! Yet no one protested the Vape Shop at Five Corners. Agreed that something needs to be done with Gieshe's. Between that and M&M, we have some prime property sitting vacant for years. Eyesore. I heard the holdout of M&M was Barone's, but I don't blame them with their prime location. Supposedly the village offered to relocate them, but to where? An abandoned building on Roosevelt? 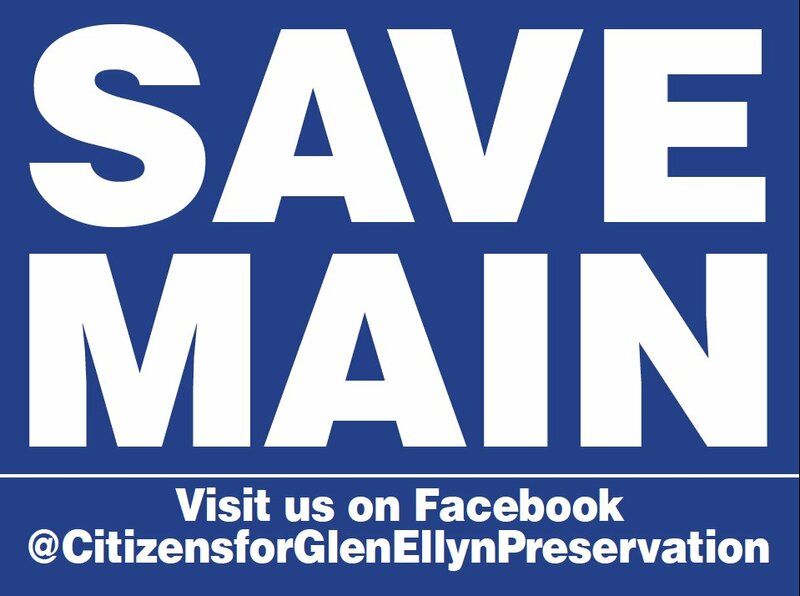 A petition against the development is now on Facebook, initiated by the Preservationist. My personal feeling is that this project is a story too tall. If only they'd gotten the two parcels along Hillside (Z+O Architects and that little 2-story office building west of Z+O), they could probably have kept the plan within the zoning height limits. As it is I think they could still approach St. Pet's for the rights to build above a portion of their parking lot (the portion behind Z+O and the office building). That would allow them to push the building footprint westward, drop down a story, and keep the same amount of units, I think. At the very least I'd like to see them push the top floor back to reduce the canyon feel. I have heard there is discussion and consideration of removing the village parking spaces, adding those spaces to the lot behind the civic center, thereby reducing the height by one floor. Anyone heard same? That store is going to sit there for another 30 years with an occasional "art" display put up by our favorite Glen Ellyn "Blurry, photoshopped to highlight one color and steal every other GE photographers ideas while having misspelled domain names that redirect to his crap work" photographer and nothing else. If it ever does get redeveloped, I will offer the owner $500 for the Giesche sign. our favorite Glen Ellyn "Blurry, photoshopped to highlight one color and steal every other GE photographers ideas while having misspelled domain names that redirect to his crap work" photographer and nothing else. Even if they could only push the corners of the top floor back it would help a little. I have heard there is discussion and consideration of removing the village parking spaces, adding those spaces to the lot behind the civic center, thereby reducing the height by one floor. Perfectly summarized. Curious if anyone else can verify this direction? I'm hesitant to agree with middle on anything after just reading his inexplicably negative attitude towards fragile transgender adolescents in D87 schools (who the F cares which restroom they use?!? ), but I do think this is my main issue with this development too. Even at three stories, this would be taller than surrounding downtown area buildings due to the greater floor-to-floor dimensions of this modern building compared to the existing older buildings downtown (taller ceilings in residential units are the norm now compared to 1925). But I really think a monolithic 5-story street wall along Main Street is going to meet major resistance in this town. Also, that facade design is going to look cheap. I'm thinking EIFS and fake brick veneer, ugly silicone joints, and cheap storefront windows at the street level. I might be willing to forgive the greater height if they just improved the architectural character of this development! These things always look worse than the renderings, not better.